Chewbacca ("Chewie" to his best pals) is famous as Han Solo's loyal friend and copilot – and now the Ultimate Copilot Chewie figure can be kids' trusted companion in adventure, wherever their imagination takes them! 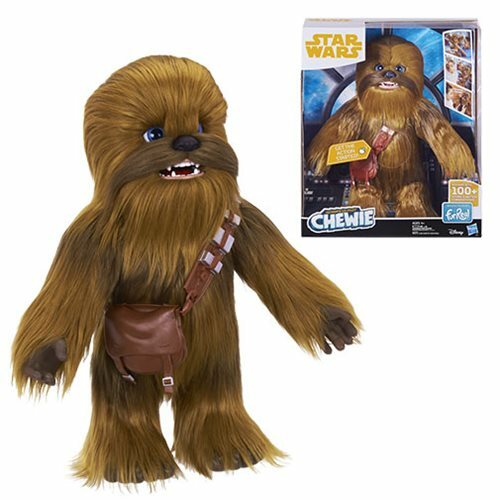 This amazing interactive plush friend features 100+ sound-and-motion combinations, responds in the Wookiee language, and reacts whenever he's in motion – sometimes in surprising ways! Kids will love their favorite Wookiee's fun facial expressions and the way he responds when they talk to him (he laughs, roars, and even snores!). He'll often raise his arms as he roars… and make contented sounds when he gets a friendly scratch on the head. This furry best friend is always ready for the next mission, big or small! Includes figure, bandolier with satchel, and instructions. Requires 4x "AA" batteries, batteries not included (demo batteries included).